The Syrian war is one of the great humanitarian disasters of our time, with hundreds of thousands of deaths, brutal state-sanctioned attacks on civilians, the rise of the black flag of ISIS, and crimes perpetrated by rebels. It feels dehumanizing, but it is still about three-dimensional human beings. The nuanced, complex details are the subject of No Turning Back: Life, Loss, and Hope in Wartime Syria, a new book by New America Fellow Rania Abouzeid. Underpinned by a rigorous investigation that reveals new information about the arming and Islamization of the uprising, No Turning Back provides an indelible new understanding of the morass by telling the stories of several individuals whose lives symbolize the hopes and dreams Syrians have for their embattled homeland. Join New America NYC for the release of No Turning Back with a conversation between Rania Abouzeid and PBS Frontline's Martin Smith on the stories of loss and hope in an unremitting war. 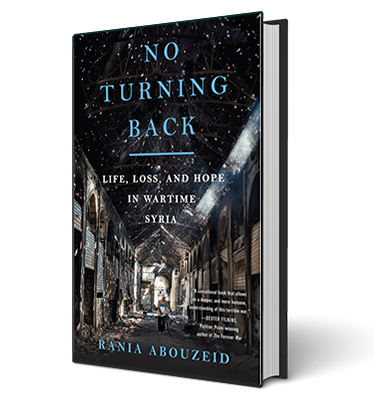 Copies of Rania Abouzeid's No Turning Back: Life, Loss, and Hope in Wartime Syria will be available for purchase. Follow the conversation online using #NoTurningBack and by following @NewAmericaNYC.